After a 273 mile journey from Beverley we caught the overnight ferry from Portsmouth to St Malo, Brittany. We arrived in loads of time and took our place behind two suspect dudes in a clapped out van, watching as everyone else was called onto the ship. Last but 2 we were. By the time we boarded the restaurant was full and we had to eat in the buffet - to be fair, it did us a favour. The buffet was excellent and saved us a few quid. Disembarking the two dudes were pulled over by the gendarmerie and held us up again, but only for a minute. Their van consisted of compartments of surf boards, skateboards,wetsuits and almost nothing else. Arrived just after 8.30am and drove the 220 miles to our first port of call - Surgères. Selected a pitch at the local campsite and eyed up the pool. 27degrees C and sunny. Unfortunately Graham forgot his swimming trunks! He cycled off off in search of a suitable shop whilst Carol chilled some beer and enjoyed the sun. Will have an early night after a van prepared dinner as we have an appointment with the bank manager to open a french bank account tomorrow am. ooo errr! Just managed to get up and out for our 10am appointment at the bank. Geraldine our advisor welcomed us into her office and so began a hour and a half of banking french style. Graham was sure that she would be able to speak English but alas not and he valiantly managed to converse well enough for us to open an account - after agreeing the terms and conditions and multiple signing of several pieces of paper. In France you pay a nominal sum per month for the privilege of having a carte bancaire and an annual fee for insurance - obligatoire. Bienvenue à France! So yes, the banking is free but the mandatory insurance for loss and theft is not. However we did get a complimentary Michelin guide to Charente Maritime- in french of course! After lunch we visit estate agents. Apparently of course what we want is rare indeed! We did visit a lovely town house with Cristelle a local agent - however it had no parking, only 1 shower room for 5 bedrooms, no pool (but room to build), and on a busy through road so some traffic noise (and we know what Graham thinks about that!) On the plus side it had been beautifully restored with exposed stone walls and marble flooring downstairs - very chic! Met Ingrid the estate agent 10 am start again which is early for us! Apparently the modern hous we were to view has been sold! So we viewed a large town house(too large) with 6 bedrooms - characterful - large garden with large trees, nice terrace and plenty room for a pool but would need a far more extensive budget than ours to refurbish. We then viewed a stone house on a relatively quiet road just a few minutes pleasant walk from the town centre via the Chateau. Unassuming on the outside but surprisingly lovely inside, with a manageable garden with just room for a pool. A well loved home full of quirky features, 4 bedrooms all good sizes - 1 downstairs with a walk in wardrobe and ensuite. A small kitchen with room to knock through to make a good sized kitchen /diner. Also under the top end of our budget so affordable to build pool and rebuild kitchen. A definate contender! Hurrah! Rear view of what we have nicknamed "The Garden House"
Also good to compare with our next viewing (house name removed) and top favourite on paper. So 2 properties to compare and contrast - spent time over dinner chez Rex discussing pros and cons - at the moment we to our surprise are leaning towards " The Garden House". And so to bed. Craaack! What was that? 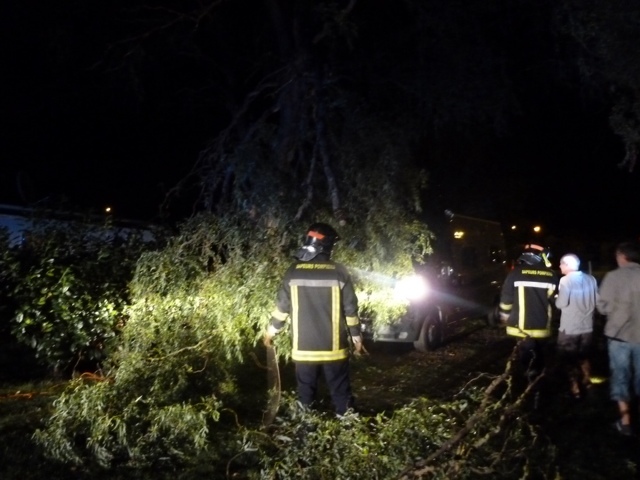 Attempted to get out of the passenger door but blocked - as we scrambled out of the drivers door into the darkness of night we were met with concerned voices and saw the remnents of large branches of a tree completly covering Rex! The campsite owner was called and the Sapeurs Pompiers (Fire brigade). A crowd of interested on lookers had now developed and a lovely couple opposite us made coffee for us as we looked on to the scene. 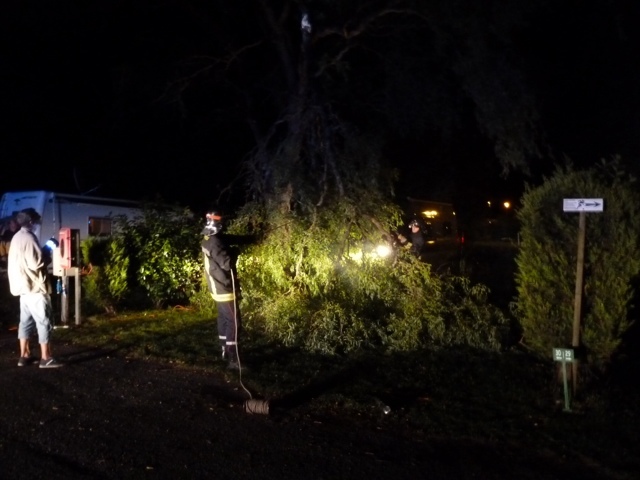 A few minutes later 2 young muscular pompiers were cutting branches and clearing the way for us to move Rex to a safer plot! Une echappé belle - lucky escape - and could have been much worse! Apparently it had been extremely dry the last few months and the extremely heavy rain through last night must have contributed to the Tree's demise -- Ha Ha! We will inspect for any damage tomorrow but it appears we may have survived with minor scratches to Rex and possibly damage to the TV ariel. Tomorrow we head off to St Jean D'Angely and a viewing booked for Monday at 9am-What? This means getting up at 7h!! A leisurely drive through possible contender villages - all appeared to have little commerce so crossed off the list. Arrived in St Jean D'Angely in sunshine but soon changed to rain and the usual heaviest and noisiest showers occured aprox 4 am! Up early to walk in to the town centre to meet Marc the estate agent in St Jean at 9am. He showed us a very grand pavillon in the centre with a fantastic pool. Very grand, old school with a prestigious feel. However it was above budget which we prepared to stretch to if if was perfect. It wasn't. It needed a lot of work to update and repair. The elderly owner had just gone to a retirement home. The decor was very grand and floral but probably not changed since the 60s! There was a enormous underground garage with a lounge off it - an enormous man cave! And also a shower/wc and twin bedroom at the back of the garage as well as numerous workrooms - like a bunker. We'd already decided No when Marc dealt the killer blow: the terrace was leaking into the basement and needed repairing - that wasn't in the brochure! En parfait état it said. Someone with a much larger budget than ours will create a beautiful home we're sure - but as in Dragon's Den we had to tell Marc we were "out". We arranged to view 2 more smaller and cheaper properties on Wednesday and then went on to our next estate agency to meet Carolyn, an English expat working as an agent. She showed us round a beautiful large modernised townhouse with a lovely large garden. It had a sluice in the basement with a canal of swiftly flowing water running through the basement (right through the middle of the house) and into a canal alongside the garden! Apparently this was the remnants of an old mill. You altered the level of the sluice dependent on how high the river was opposite. Although the house was lovely and just on budget we felt it was perhaps too large a garden and we would have to put in a pool. The thought of fast flowing water running through the basement in the winter months when it was not occupied was also a concern - so again we were " out". Carolyn gave us some good advice re life in the area for expats . She agreed with us that the unamed house was currently overpriced by the owners and was to feedback to them - not sure if the owner would agree to sell it if not priced more sensibly. She also gave us her home telephone number if we should need any further help which was very kind. We were by this point exhausted and couldn't face another round of estate agent visiting so wandered back to the campsite for a very late lunch. During the evening we pondered on "The Garden House". We prefer Surgères to St. Jean, it's in a good location, it's the right size and price, it has an ensuite (quite rare in France), and an opportunity for us to add value by improvements. What were we doing messing about searching out others? We decide that, as it's due to keep raining for the next few days, why not go back for a second look and then holiday when it's sunny. So that's what we plan. Graham will phone Marc tomorrow and cancel the two viewings and then ring Ingrid, the agent in Surgères to request another viewing. Had a lie in. Graham rings Marc and achieves a small milestone: a conversation on the phone tout en francais - albeit a small one, a personal first. We travel the long way back to Surgères, through Saint Prochaire and Pont L'Abbe d'Arnoult - larger villages with shops and restaurants with shortlisted properties situated within, and have a good walk round. However we are underwhelmed and feel that Surgères town is still our preferred location. Graham rings Ingrid to arrange another viewing of "the Garden House" as this appears to tick all the boxes for us. So back to Surgères - requesting a tree free pitch at the campsite! We will re-view the house tomorrow am- we hope it will still feel as nice on a second viewing. Just managed to get to our appointment with Ingrid the estate agent at 10.30am! The weather is horrid - torrential rain! We revisited the house now named La Maison Pierre (the stone house - not quite, but near enough -ed.). It was even better than we first thought! We met the owners M and Mme Drapeau who were delightful. Spent lots of time measuring and taking photos, asking about insulation, electrics, etc., then back to the office to make an offer. Ingid advised us to make a lower offer than we thought we should. So we left Ingrid to negotiate on our behalf - and left to have a lovely lunch in a local Italian restaurant. On not hearing from Ingrid we decided to visit the nearest seaside resort Chataleillon Plage - however as it was raining heavily we decided to move inland to Rochefort. As we arrived at the municipal campsite Ingrid rang - another couple viewed the house 2 weeks before with another agency and are seeking finance. The only way to definitely secure the sale is to offer the asking price and sign the sale document today! Be the first! 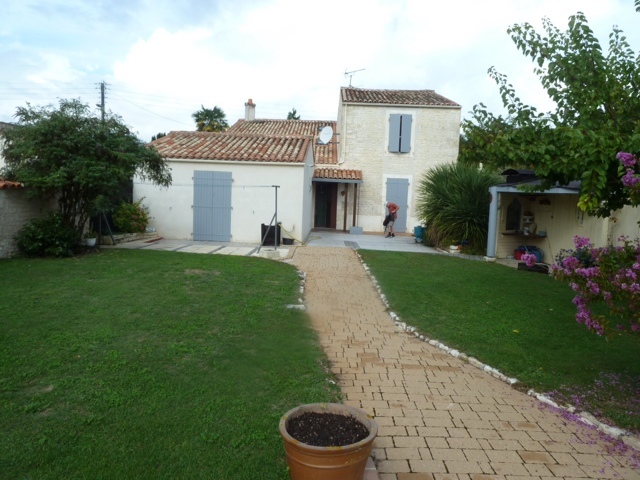 If you offer the asking price in France the vendor HAS to accept and he is it bound by it. No gazumping - good system! So we drove back to Surgères as quickly as Rex allowed and signed the document. We returned to Rochefort and on arrival at the site recieved a call from Ingrid to say the owners have signed agreeing our purchase and it is ours! They are happy, we are happy. They will be leaving all the beds upstairs and some other items of furniture as they are downsizing to an apartment by the sea. We think they felt sorry for us paying the top price! Nothing wrong with emotional blackmail! And part of us felt we should pay a premium as we are foreigners, and the other interested party are local. A bit like a second home tax but it cuts out the middleman and goes straight to the owner. No Champagne available so we celebrated with a strong beer! Let the adventure begin! Soit commencer l'aventure!